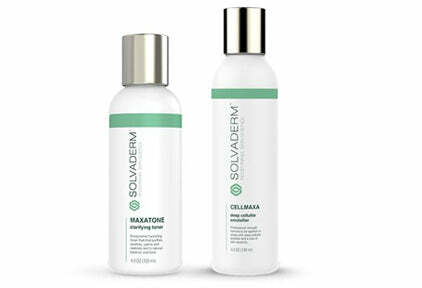 Dermpura: It is impossible to imagine any skincare routine without a cleanser, which is why Solvaderm picked its reliable cleansing formula that can make grime and dirt surface. The ingredients are perfectly gentle to your skin and the formula has a rich quantity of antioxidants for extra protection. Maxatone: Another mandatory inclusion in skincare formulas is a toner. However, this one has a complex formula that does far more than tightening pores and making skin smooth. It also prevents potential issues with dryness and boosts hydration levels to ensure optimal moisture around the clock. It can make your skin blemish-free if it is used constantly. Excelagene: It is a formula that is incredibly powerful thanks as it can promote hydration levels, as well as stimulate collagen production to facilitate improved skin synthesis. Stemuderm: This cream is carefully optimized and filled with peptides that can work on diminishing fine lines and any other imperfections on your skin. It also helps your skin to retain moisture for hours. 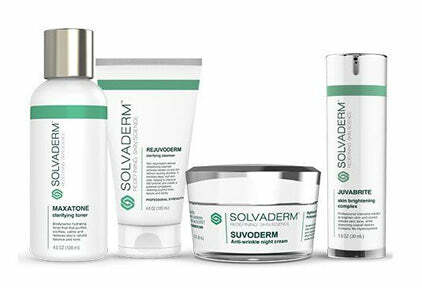 Suvoderm: It is called a repair cream as it utilizes the time while you are asleep to revitalize the skin and reverse any damage made during the day. It can return youthful appearance to your skin and delay or minimize aging signs. Step 1: Dermpura is the initial step in your nighttime skincare routine. You want to use circular movements to apply it to wet skin. It shouldn’t take more than a minute or two. Rinse off and pat dry, but use lukewarm water! Step 2: Maxatone is the next product in the line, but here you will also need a cotton ball. Your skin should be cleansed and dry when applying. Also use circular movement and apply throughout the entire face. Step 3: Excelagene has that healing effect you need next. Grab a pea-sized amount (a couple of drops) on your fingertips. The goal is to spread the product on your face in a thin layer. Make sure to evenly spread it and allow it several minutes to absorb. 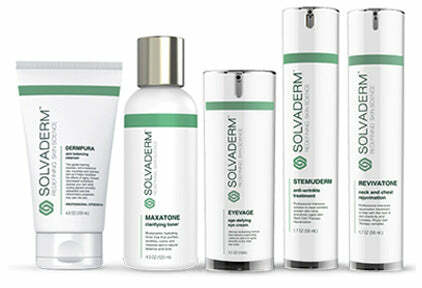 Step 4: Now it is time for Stemuderm that can rejuvenate your skin. Feel free to use a generous amount of the cream on your face. Use massage-like movements to help the product penetrate deeply. Allow it to absorb before moving on. 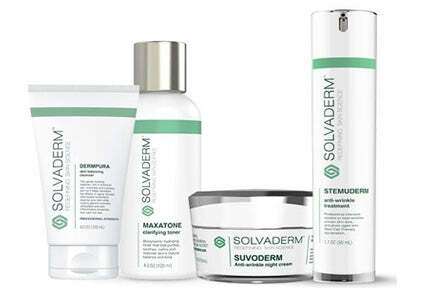 Step 5: Finally, use Suvoderm to further boost rejuvenation. The process is similar to the previous cream, but you need a small amount. However, even distribution is vital for optimal effectiveness. Chondrus Crispus (Seaweed) Extract: This component promotes hydration and utilizes nutrients it contains to provide the essential skin nourishment. This is how it supports healing and revitalization of your skin. Eriobotrya Japonica Extract: Your skin needs a lot of moisture, especially when dealing with aging signs. This ingredient brings hydration, as well as antioxidants that promote a youthful appearance. Glycerin: Another intensive moisturizer that can give you that young look you were looking for. Sodium Olivate: If you want your skin to truly regenerate, you will need this compound to eliminate any problematic skin cells and allow healthy ones to arise. Rose Hip Seed: It plays an important role in boosting elasticity and it can penetrate deeply into the skin to optimize hydration. Hamamelis Virginiana (Witch Hazel) Extract: It is a natural ingredient that works as a skin toner as it tightens your pores to prevent infection-causing bacteria from entering and it helps to purify your pores. Achillea Millefolium Extract: Germs are annoying as they are the most frequent cause f skin infections. This compound helps to eliminate them and promote clean skin. Hyaluronic Acid: This compound can assist in reducing the visibility of fine lines and wrinkles. It does this by enabling your skin to improve its capability in retaining moisture. Symphytum Officinale Leaf Extract: An ingredient that works on purifying your skin and dealing with any impurities. It promotes radiance and healthy skin thanks to its anti-inflammatory properties. Equisetum Arvense Extract: It further adds to the potency of the formula to moisturize your skin. It also strengthens skin fibers to minimize oxidative stress. Calendula Officinalis Flower Extract: A calming effect on inflamed skin is what this ingredient delivers. It also promotes a youthful appearance by boosting moisture delivery to your skin. Glycyrrhiza Glabra (Licorice) Root Extract: A natural-based compound that has a soothing effect and promotes bright complexion to boost overall attractiveness of your skin. Citrus Medica Limonum (Lemon) Peel Extract: A component that has astringent characteristics and can help to deal with hyperpigmentation issues. It promotes brightness and smoothness of the skin. Hyaluronic Acid: This product delivers various molecular weights of this compound, but its effectiveness does not change. It promotes optimal hydration levels by helping your skin to hold moisture in for hours. Ameliox (Carnosine, Silybum Marianum Fruit Extract, and Tocopherol): It boosts collagen production, which strengthens your skin and promotes its optimal health while helping it to combat aging signs. PerfectionPeptide P7 (Acetyl sh-Heptapeptide-1, Shea Butter, and Glycerin): It is a conditioning agent, but it also protects your skin against oxidative damage thanks to its antioxidant traits. Malus Domestica Fruit Cell Culture: This compound works on promoting skin rejuvenation and healing. It has antioxidant properties that help to achieve and maintain optimal health of skin cells. Acetyl Hexapeptide-8: An amino acid that can promote a youthful appearance and postpone wrinkling. Dipeptide Diaminobutyroyl Benzylamide Diacetate: Temple Viper Snake makes the venom that this compound resembles. However, this ingredient is perfectly safe. Its benefits include ironing wrinkles thanks to preventing facial muscle contractions which led to them in the first place. Acetyl Glutamyl Heptapeptide-1: Another peptide that boosts smooth skin. This one also diminishes movement of the muscles to help reduce the visibility of the wrinkles. Palmitoyl Oligopeptide: It positively affects collagen production and promotes elasticity of the skin. Matrixyl 3000 (Palmitoyl Tetrapeptide-7 and Pentapeptide-3): One of the crucial ingredients of the formula and very efficient in boosting revitalization and renewal of the skin while also promoting hydration. Jojoba Seed Oil: A natural-sourced oil that can improve the absorption of other ingredients included in the formula. Apricot Kernel Oil: Another plant-based oil that has certain moisturizing properties, but it also soothes inflamed skin. Squalane: It is a compound sourced from olive oil and it can help to deal with wrinkles, as well as assist in retaining moisture. Hyaluronic Acid: This remains the crucial ingredient of the compound when it comes to moisture retention. It is incredibly powerful in holding water which promotes suppleness of the skin. Niacinamide: You probably heard of vitamin B3 – this is one of its forms. The ingredient has considerable antioxidant properties and can protect the skin against damaging environmental hazards. Some studies suggest that it can also prevent hyperpigmentation. Saccharomyces/Copper Ferment (Cu Complex): The supplementation of copper benefits overall skin health. Vitamin E: Incredibly important for the nourishment of the skin – it contains both antioxidant and hydrating properties and it promotes skin rejuvenation. Hyaluronic Acid: It optimizes skin’s hydration levels with its incredible ability to attract and hold moisture. Thioctic Acid (Alpha Lipoic Acid): The skin can absorb a significant amount of this compound because it is soluble in water and fat. It promotes plumpness and blends well with other components. Persea Gratissima (Avocado) Oil: This plant-based ingredient plays an important role in fighting against inflammation while also helping to minimize and reverse aging signs. It nourishes the skin with some essential nutrients, including essential fatty acids. Glycine Soja (Soybean) Oil: It promotes skin renewal and regeneration and calms irritations. Carnitine: It strengthens your skin and positively affects its abilities to fight against oxidative stress. Vitis Vinifera (Grape) Seed Oil: A natural ingredient that is incredibly rich in antioxidants and can prevent oxidative damage. Ubiquinone (Coenzyme Q-10): A skin moisturizer that is also a potent antioxidant that can promote radiance. 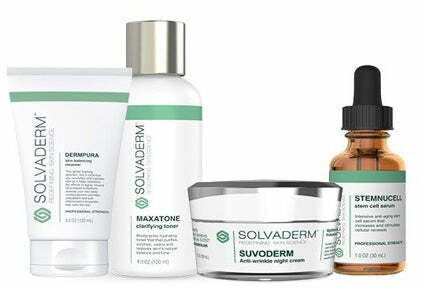 It is an ideal fit with the Ageless Skin System (AM) and together they deliver the best results. This routine is perfect for the skin that has been dealing with aging signs. The system works overnight to repair damaged skin and promote revitalization. The regimen helps to iron out imperfections, such as fine lines and wrinkles. 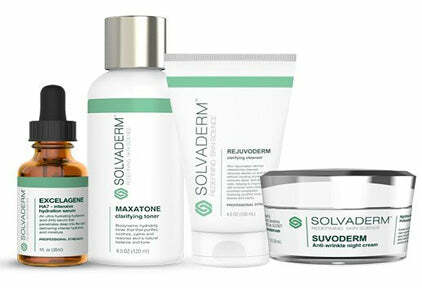 You can delay and minimize skin aging if you constantly use this system.